I made this ages ago and never posted it. 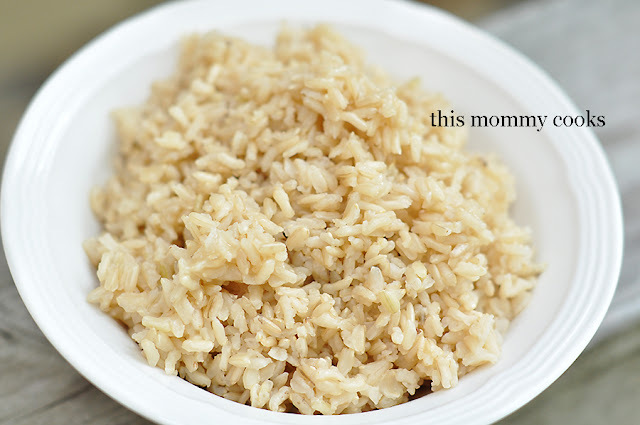 I'm making teriyaki chicken tonight and was reminded how great this rice was with it. I love that you do it in the oven, so you can forget about it. I tend to do that when I'm cooking rice, and then it is burned and stuck to the pot or boiling over...I am never good at setting my timer. But you just pop this in the oven and in an hour or so it's ready to go! Preheat the oven to 350 degrees. Lightly grease an 8X8-inch or 9X9-inch baking dish. Place the rice in the prepared pan and pour in the liquid. Stir to spread the rice. Cover tightly with a double layer of aluminum foil and bake for 1 hour and 10 minutes. Remove from the oven and let sit for five minutes before removing the aluminum foil and fluffing with a fork. If your rice still has a bit of liquid on the bottom or if it is dried out, adjust the baking time up or down to make changes. If you use a clear baking dish, you'll be able to keep an eye on the rice under the foil. I must try this. Love that it's baked. So simple too - so glad you shared.